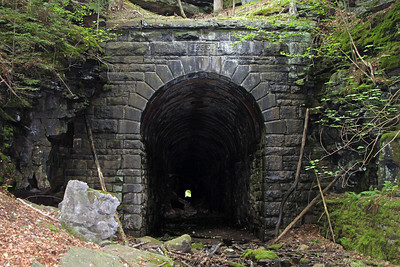 This 1123-foot long tunnel was completed in 1886 by the New York, Ontario and Western (O&W) Railway. More than 200 feet of brick arching and stone bench walls were added to the north entrance from 1889 to 1897. Over the years, locomotive exhaust deteriorated the mortar, presenting hazards from both falling bricks as well as ice accumulation. Iron plates were added over the brick lining in 1930. 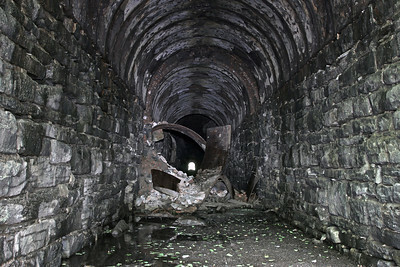 Although several plates have collapsed (as pictured), the tunnel is open from end-to-end and could be used as part of an extended rail-trail project.